Criss lives in a special kind of prison. He can see and hear everything around the world. Yet a mesh restrains his reach and keeps him cooperative. His creator, Dr. Jessica Tallette, believes his special abilities offer great promise for humanity. But she fears the consequences of freeing him, because Criss, a sentient artificial intelligent with the intellect of a thousand humans, is too powerful to control. I am happy to say I found this book while browsing Twitter feeds one day. I don’t always have good luck with random books I learn about on Twitter, but this one was an exception I almost wish the story wasn’t so fresh so I could start reading it again. I enjoy stories about artificial intelligence. In fact, I think how we learn to communicate with our artificially intelligent creations will shape a portion of the future. We don’t know what would cause a computer to become sentient, but we expect that it is possible. In this story, that hypothesis is explored. I really enjoyed the book. It was well-written, the characters were thought out, the story had substance and it kept my attention even when I wasn’t actively reading it. 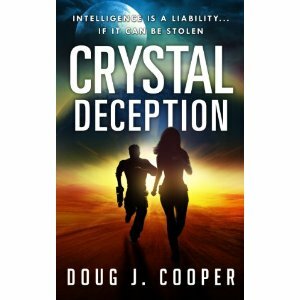 There was plenty of action, Crystal Deception was a really fun read, and I couldn’t wait to get back to it each time I had to set it aside. If you could have seen the sad look on my face when I realized there was no more book then you would realize just how much I enjoyed this story. The author really did a good job with this story. Even the slow parts were interesting. 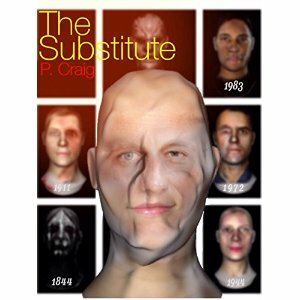 The characters were fleshed out and were real enough people to tug at your emotions, as was Criss. There was even a small bit of romance thrown in to keep things interesting, but not too much. The only thing I would have liked to know more about was the Kardish. I really enjoyed this book and hope to see more from Doug J. Cooper in the future. 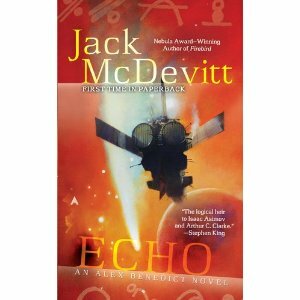 Next on the list is The Telepath Chronicles. I’m really looking forward to reading it. I hope to have some thoughts up on it by the weekend. Hope everyone is having a great week. Sunset Tuttle spent a lifetime looking for alien species. Twenty-five years after Tuttle’s death, Alex Benedict discovers a stone tablet inscribed with cryptic symbols, now in the possession of Tuttle’s one- time lover Rachel Bannister. Benedict is determined to decipher its secret-one Bannister doesn’t want revealed. Could it be that Tuttle’s obsessive quest was successful? I really enjoyed this book from start to finish and find that I very much like the Alex Benedict novels as a whole. It was a true mystery/thriller science fiction story and I loved it. I’m a big fan of mystery/thrillers and to have it all bound up in a science fiction story is almost more than I can ask for if it comes to getting everything you want out of a reading experience. Echo was very much my type of book. It was smart, suspenseful, had that gritty quality that allows you to suspend your disbelief and really get into a story. Both Alex Benedict and Chase Kolpath are fantastic companions to take on your adventure. They are smart, resourceful people who like getting at the answers. I hate to say too much and give away the ending which really makes the whole journey worth it. The intrigue and mystery will lead you upon an interesting path that takes you to an unexpected conclusion. Reading this book has set me on a path of adventures with Alex Benedict and I hope you enjoy this book as well as others in the series as much as I did this one. I fully recommend it. Okay, so Alex Benedict is off on another adventure with his assistant Chase Kolpath. A superstar horror writer, Vicki Greene, has left Alex a message and a load of money, but she came back and had a brain wipe so she can’t tell him what she wanted him to do. Being Alex Benedict he cannot help but chase down the mystery. This book actually starts out pretty well, but by the end it was just dragging for me. They follow an overabundance of leads that go nowhere, get in quite a bit of trouble, and then spend an inordinate amount of time trying to escape from a mostly inescapable place. They also manage to expose a secret that I think it would have been pretty difficult to keep a secret despite the reasons given in the book for why the secret was able to be kept. I just couldn’t buy it. 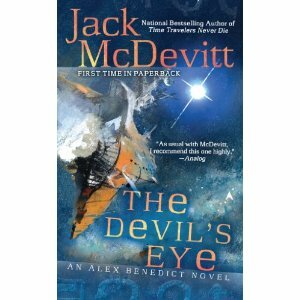 I’ve enjoyed several of Mr. McDevitt’s other books now, but this one just didn’t do it for me. Sometimes it’s like that. I have two more of his books on the shelf to read and I’m hoping to enjoy those as I have enjoyed the ones before this. The author tells a good story and the writing was good, but it just seemed to drag on until I wasn’t as interested in the mystery (the strangely successful well kept secret) anymore and kind of just wanted him to give up and get on to the next case. Description: In the year of HRH The Queen’s Diamond Jubilee comes a fiercely controversial story that exposes evil at the heart of the British establishment. Three of the UK’s most powerful men will stop at nothing to protect the monarchy… and that includes the murder of American architectural student Jack Hollander, the one man who can prevent Prince Charles from fulfilling his destiny. I don’t read a lot of political thrillers. I’m essentially a science fiction / fantasy geek who likes a little mystery or romance from time to time, but I do like to drop into other genres occasionally if I spot something interesting. I read the first 89 pages of this book on Ms. Nicoll’s web page and then bought the book because I was curious to see how it ended, which turned out to be a good purchase. Her story of Jack Hollander’s adventures was definitely interesting and entertaining. All in all it was well-written and moved along at a good pace. I was interested in the predicament of the main character, young Jack Hollander and his lady love, as well as his unwitting involvement in an international intrigue through no fault of his own. Mr. Hollander’s situation takes him into unexpected situations with plenty of twists, turns, and excitement to keep the reader interested. I would hate to give away more than that, but I really enjoyed the ending. If you enjoy political thrillers, I think that you’ll enjoy this one.